In keeping with today's theme of antics and tomfoolery, above is an image of the Fontana di Venere at Villa d'Este, Tivoli, and below is an image of another fountain at the villa, the Teatro e Fontana della Civetta. 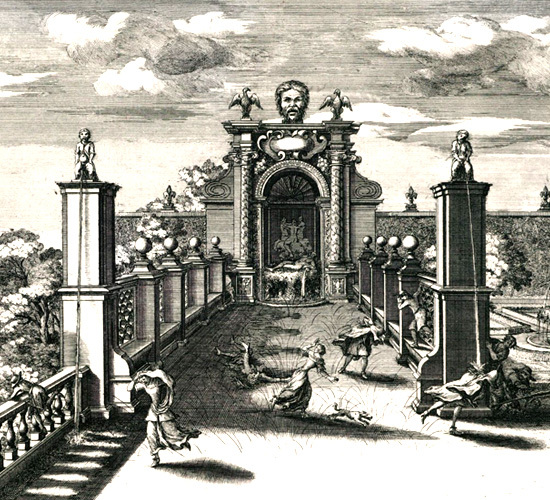 Made by Giovanni Francesco Venturini in 1691 and digitized by Catena, the Digital Archive of Historic Gardens and Landscapes, they are two of the best illustrations available online showing a giochi d'acqua in action. Giochi d'acqua were water jets concealed between paving slabs, in benches, staircases and statues. Controlled by gardeners behind the scenes, these hidden little fountains would sprinkle unsuspecting visitors, catching them off-guard. One minute they're enjoying the genteel pleasantries of a garden walk and the next minute they're scampering about in their fineries, frantically searching for an escape, if there is one. With the spigots in the hands of the lascivious, women could get a titillating squirt up their dresses or get completely soaked from a puti's simulated urine or other. Replace the water with battery acid and you could have the penultimate setting of Indiana Jones V or Tomb Raider III. Not in the Mayan jungles of the Yucatan or steamy Angkor Wat but in a sun-drenched papal garden of Tuscany. It's an anxious space under constant threat of eruptions. 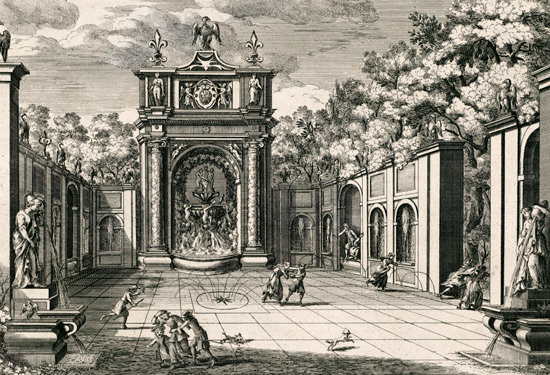 In any case, these whimsical water features — which really were an astoundingly complex network of hydraulics — were common in Mannerist Italian gardens, since they provided the element of surprise, an important feature of any mannerist work. "I distinguish the picturesque and the beautiful, and I add to them, in the laying out of grounds, a third and distinct quality, which I call unexpectedness." "Pray, sir," said Mr Milestone, "by what name do you distinguish this character, when a person walks round the grounds for a second time?" I expect it was called "damned annoying"
A hundred secret sprinklers at my command...stop, you're teasing me. What fun that would be. And how very impressive for the time, a true feat of engineering!